Marooned on a dusty slope in the world's largest refugee camp, Osiur Rahman looked to the hill where a Rohingya girl was buried in a landslide just days earlier and contemplated his chances should the earth give way beneath his feet. "Our families would be killed. There are children everywhere around here. We constantly fear that rain could trigger a landslide," the 53-year-old told AFP on the steep embankment where he lives with nine family members in a bamboo shack. For the 700,000 Rohingya Muslims who have fled to southeast Bangladesh in the past nine months, the approaching monsoon season poses the most serious threat since they were violently expelled from Myanmar. 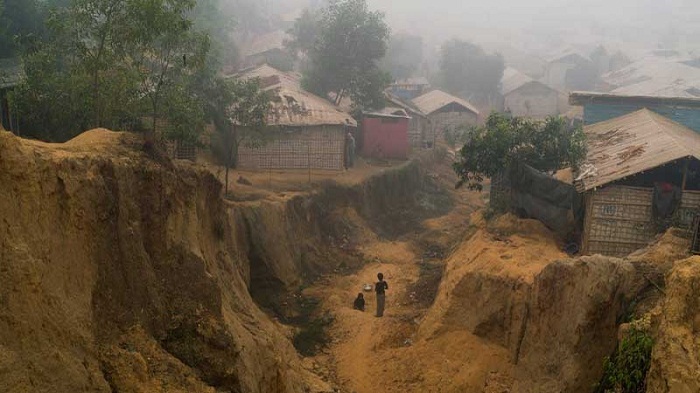 Close to one million of the stateless Muslim minority live in the Cox's Bazar district but the new arrivals, stranded on unstable hills in bamboo and plastic shacks, are especially vulnerable. A massive operation to shore up the camps against disaster is in overdrive, with bulldozers levelling hills and refugees bunkering down however they can. But as the rains approach, the young girl's death this month in a torrent of mud and rock has heightened fears of a much greater tragedy. There is a dearth of safe land to relocate the estimated 200,000 refugees in direct danger of floods and landslides, and just 21,000 have been moved so far. "We could literally have lives lost as people slide down hillsides and valleys are flooded with water," Kevin J. Allen, head of the UNHCR refugee agency's operations in Cox's Bazar, told AFP. "They could face yet again another emergency, this time driven by mother nature." The camps' makeshift homes are predicted to receive more than 2.5 metres (eight feet) of rainfall over three months starting June -- roughly triple what Britain gets in a year. Cox's Bazar has been battered by cyclones for three years running, having already suffered astonishing devastation in the past. Cyclones have killed tens of thousands along the Bangladesh coast in recent decades and countless more have been swept to their deaths in floods and landslides. This time, nature is on a collision course with refugees who have nowhere to run -- no higher ground and no cyclone shelters. The first storms underscored the fragility of the camps: the brief rains turned roads into quagmires, crumbled hillsides and flooded low-lying areas. The huge endeavour to prevent disaster has seen slopes vulnerable to collapse flattened and extensive canal systems carved throughout the camps. Toilets are being fortified with sandbags to prevent a major disease outbreak should floodwater meet overflowing latrines. But there are limits to how much can be done. Bangladesh has restricted the use of sturdier materials for shelters because it may suggest the Rohingya plan to stay, contrary to Dhaka's desire to return them to Myanmar. The roof was blown clean off Noor Mohammad's shack in a recent squall. He had gathered chunks of wood and rocks to weigh it down but was "scared of what could pass" when Bangladesh's wild weather barrels through. The Rohingya are no strangers to the monsoon, he said. But in Myanmar, villages were built to withstand its ferocity and trees provided a bulwark against the elements. "Here, there is nothing to stop the wind," he said, gesturing to the deforested hills stretching for miles. Bangladesh has freed up hundreds of hectares (acres) but most is hilly and was prone to landslides even before the Rohingya uprooted trees for shelters and firewood. Mosques and community centres could shelter 150,000 people if needed, said Kazi Abdur Rahman, acting district administrator of Cox's Bazar. "But if there is a big cyclone, and all these people need relocating, there is not a system for that yet. It is not possible to shift one million people," he told AFP. The Rohingya, who have fled persecution time and again, fear being on the run once more. "Everybody is afraid, wondering where we'll go if our houses are destroyed," Rohingya imam Muhammad Yusuf told AFP. Aid groups say a cyclone or devastating storm could cut access to the camps for a week -- restricting food and supplies to a tent city with a population greater than San Francisco. The World Food Programme's emergency coordinator Peter Guest said thousands of porters were being assembled to carry food on foot if access roads were cut. Those left homeless or starving will have nowhere to run anyway: the Rohingya are encircled by military checkpoints and prohibited from leaving. "What else can we do? If Allah does not protect us, we will die," said 60-year-old refugee Dil Mohammad.